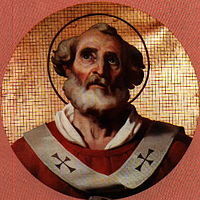 Pope Saint Hormisdas was pope from July 20, 514, to 523. He is best known for his role in ending the Acacian schism between Rome and Constantinople, reuniting the Greek and Latin churches after several decades of bitter division. Born to a wealthy family, Hormisdas had married and fathered children before becoming a deacon of the Roman church. In that capacity he was a prominent supporter of his predecessor, Pope Symmachus, who had faced the challenge of a rival pope and charges of moral and financial impropriety. As pope, Hormisdas' first task was to reconcile with the remaining supporters of the former antipope Laurentius. Hormisdas then turned his attention to relations between Rome and the East. Most of what we know of his papacy relates to the Acacian schism, which had existed since 484. The schism was the result of Constantinople's attempt to set aside the Council of Chalcedon and reconcile the Monophysites with the main body of the church, a policy absolutely rejected by successive popes. After years of unsuccessful negotiations and intrigues, the church of Constantinople was reunited with the Roman church in 519 by means of the confession of faith known as the Formula of Hormisdas. Recognized as a saint in both the Catholic and Orthodox churches, but not by the Oriental Orthodox church, Hormisdas is the patron saint of grooms and stable-boys. 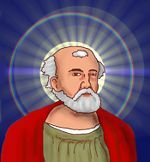 His feast day is celebrated on August 6. His son would later become Pope Silverius. Theodoric was an Arian Christian and thus a heretic, but Hormisdas maintained a good working relationship with him. Hormisdas belonged to a wealthy and prominent family of the Campagna di Roma, the low-lying area surrounding Rome in today's Lazio region of central Italy. He was married before being ordained ecclesiastical orders. Under Pope Symmachus (498-514) Hormisdas held the office of deacon of the Roman church. He was one of the most visible and loyal clerical attendants of Symmachus during the schism of Laurentius, who was recognized for several years as pope by King Theodoric the Great. Hormisdas was notary—appointed to draw up official documents—at the synod held at Saint Peter's in 502, during a period when his pope, Symmachus, was under indictment for fornication and financial corruption. Around this time, his fellow aristocrat, Bishop Ennodius of Pavia, expressed the conviction that Deacon Hormisidas, who was known for his piety, wealth, and noble birth, would one day become pope himself. Symmachus eventually emerged as the sole pope, occupying himself with such issues as the Acacian schism, which had also been a factor in the anti-papacy of Laurentius. Underlying this split between Rome and Constantinople was the Eastern Roman Empire's policy of reconciliation with Monophysitism on the basis of the imperially endorsed theological document known as the Henotikon. Intended as an "act of union," the Henotikon in effect set aside the creed adopted at the Council of Chalcedon and sidestepped the crucial issue of whether Christ had "one nature" (divine-human) or two (divine and human). The day after the funeral of Symmachus (July 20, 514) Hormisdas was elected and consecrated as pope. Although some of the clergy and senators had never acquiesced to the removal of Laurentius, there is no mention of divisions or disturbances at Hormisidas' election. One of the new pope's first cares, nevertheless, was to remove the last vestiges of the Laurentian schism in Rome. He thus received back into the church those adherents who had not already been reconciled and were willing to be re-united under him as their bishop. From the beginning of his pontificate, the affairs of the East occupied Hormisdas' special attention. The Acacian schism, named after Patriarch Acacius of Constantinople, arose from Rome's absolute rejection of the Henotikon of Emperor Zeno, which Acacius had supported. A number of eastern bishops who faced Monophysite (or Miaphysite) rivals in their cities had appealed to Rome during the pontificate of Symmachus, in order that their positions might be strengthened and the progress of Monophysitism checked. Symmachus had required them to join in the excommunication of Patriarch Acacius initiated by Pope Felix III, but the Orientals were not ready for this step. Part of their reticence had to do with the papacy's own refusal to recognize Constantinople as "New Rome," which, after all, had been proclaimed by the Council of Chalcedon itself. Emperor Anastasius I (491-518), Zeno's successor, maintained the Henotikon, which from Rome's point of view constituted an unacceptable repudiation of Chalcedon. Anastasius took measures against those who refused to sign the Henotikon, and thus three pro-Chaldedonian patriarchs, Macedonius of Constantinople, Elias of Jerusalem, and Flavianus of Antioch had been driven from their sees. The Roman position was by no means without its supporters in the secular world of the East. Taking advantage of popular discontent aroused against Anastasius by his toleration of Monophysitism, a commander in the army named Vitalian led a revolt against him. Vitalian demanded, among other things, that the Council of Chalcedon should be recognized and that unity with Rome reestablished. He gained numerous adherents and defeated the emperor's nephew, Hypatius, in a battle outside of Constantinople. Anastasius was thus obliged to negotiate with him. One of the terms of Vitalian's submission was that the emperor must take an oath to convene a church synod at Heraclea in Thrace, invite the pope to attend it, and submit to his arbitration. Coins bearing the image of Anastasius I. Left with little choice in the matter, Anastasius wrote to Hormisdas on December 28, 514, inviting him to the synod on July 1 of the following year. This letter was first submitted to Vitalian, whose representative accompanied the bearer to Rome. A second, less courteous communication, was dated January 12. The second letter reached Rome before the first one, and on April 4, Hormisdas answered it, expressing his delight at the prospect of peace, but at the same time defending the memory of his papal predecessors. The bearers of the emperor's first letter arrived on May 14. The pope guardedly carried on negotiations with them, convened a synod at Rome, and then wrote a letter to the emperor, dated July 8, in which he announced plans for the departure of an embassy for Constantinople. Meanwhile the 200 bishops who had assembled on July 1, at Heraclea at the emperor's behest left without accomplishing anything. Hormisdas' embassy to the imperial court brought with them a letter dated August 1 515, which is still preserved. So also are the minute instructions given the legates with regard to the position they were to take. These indicated that if the emperor agreed to the pope's proposals, then Hormisdas was ready, if necessary, to appear in person at a council. The pope further sent his formula of a confession of faith for the Eastern bishops to sign. This confession of faith is known as the Formula Hormisdae. In addition to reaffirming the theology of the Council of Chalcedon, stresses the absolute primacy of the pope as Saint Peter's representative: "…The words of Our Lord Jesus Christ: 'Thou art Peter; and upon this rock I will build my church' cannot be disregarded; these things which were spoken are demonstrated by the results, for the Catholic religion has been preserved ever immaculate in the Apostolic See." The confession condemns both Nestorianism and Monophysitism, pointedly including Patriarch Acacius of Constantinople among those who are anathematized. For Emperor Anastasius, to agree to such a formula would constitute a complete surrender to Rome. The embassy thus brought about no real results. Anastasius, without breaking off the negotiations, gave the envoys an evasive letter for Hormisdas. A new revolt of Vitalian was suppressed, and an imperial embassy which subsequently came to Rome adopted a less than accommodating posture. One of their aims seems to have been to garner support for Constantinople's position in the Roman Senate, some of whose leaders had been amenable to cooperation during the Laurentian schism. The senate and King Theodoric, however, remained steadfast in their support of the pope. Meanwhile, an additional number of eastern bishops had entered into relations with Rome, and several of them had also conferred with the papal legates in Constantinople on the question of the reunion. They now agreed to condemn of Acacius and signed the confession of faith of Hormisdas. However, a second papal embassy to Constantinople had no better success. The pope's delegates secretly circulated Hormisdas' letters calling the people of Constantinople to reunite with the Roman church. When the emperor heard of this, he had the ambassadors brought out of the city by a private gate to the seashore, put on shipboard, and sent back to Italy. Then Anastasius, currently with nothing to fear from Vitalian, wrote an insolent letter to Hormisdas dated July 11, 517, breaking off the negotiations. He redoubled his efforts to enforce the Henotikon in the East and persecuted the advocates of union with Rome. Ultimately, it would be not be diplomacy that finally paved the way for reunion. On July 9, 518, Anastasius died very suddenly in the midst of a terrible storm. Shortly before that date, Timotheus, the patriarch of Constantinople who supported the policy of Acacius, had also passed away. Fortunately for the pope, Emperor Justin I (518-527), who succeeded Anastasius, was a Chalcedonian Christian who strongly rejected Monophysitism. Emperor Juntin I succeeded Anastasius and ended the Acacian schism by adopting the formula of Hormisdas. The new patriarch, John II, known to history as John of Cappadocia, was now faced with the question of whether he should recognize the Chalcedonian formula, thus opening the way to reunion between the Greek and Latin churches, or continue to support the Henotikon in order to avoid conflict with the still substantial Monophysite/Miaphysite movement in the East. A popular outcry at the Cathedral of Constantinople in the presence of the new emperor motivated the patriarch to declare himself in favor of the Chalcedonian formula and to call a synod to formalize reunion. The synod, held at Constantinople, confirmed this direction, and an imperial envoy departed for Rome to entreat the pope on behalf of the emperor. After receiving King Theodoric's advice, Hormisdas appointed a delegation with the same instructions and confession of faith which were given the legates of 515. The embassy was received in Constantinople with great splendor. Under the new imperial policy, the negotiations could not have gone better for the pope. All of the demands of the pontiff were conceded. The name of the now condemned Patriarch Acacius, as well as the names of the Emperors Anastasius and Zeno, were stricken from the church diptychs (honor rolls) and Patriarch John II of Constantinople formally accepted the Formula of Hormisdas. On March 28, 519, in the Cathedral of Constantinople in presence of a great throng of people, the reunion of the Greek Church with Rome was ratified in the most solemn manner. The majority—though certainly not all—of the eastern bishops approved and signed the Formula of Hormisdas. Monophysite hold-outs were deposed from their positions and replaced with pro-Chalcedonian candidates. In the midst of all this activity, a new quarrel broke out, which turned upon the formula: "One of the Trinity was crucified." This formula was promulgated at Constantinople in 519 by John Maxentius and numerous Scythian monks. Both the patriarch's and the pope's legates opposed the demand that this formula should be embodied as an official church dogma. The monks then proceeded to Rome where they stirred up controversy. They also addressed the African bishops then residing in Sardinia. In 521, Hormisdas officially pronounced that the formula in question, although not false, was dangerous because it was easily subject to a false (Monophysite) interpretation. He affirmed that the Council of Chalcedon needed no amendment. Apparently at the instigation of the above-mentioned monks, an African bishop named Possessor appealed to the pope for information regarding the Roman church's attitude toward the Bishop Faustus of Riez, whose writings appeared to the Africans to smack of Pelagianism. In his reply, Hormisdas severely rebuked the quarrelsome spirit of these monks. He refused to forbid the reading of the works of Faustus, deciding that what was good in them should be preserved and what was contrary to the doctrine of the Church should be rejected. In the spirit of reunion, Hormisdas directed that a Latin translation of the canons of the Greek Church be prepared by Dionysius Exiguus. He sent letters to several bishops in Spain and Gaul on ecclesiastical matters and gave directions regarding church administration. His relations with King Theodoric remained amicable. The Liber Pontificalis enumerates valuable gifts presented to Saint Peter's Basilica by this king, as well as by the Emperor Justin, during Hormisidas' reign. Hormisdas was buried at Saint Peter's Basilica in Rome. Pope Hormisdas presided over one of the Catholic Church's greatest victories: The submission of the East to end the Acacian schism. This triumph greatly increased the papacy's international prestige and strongly bolstered its claim to be the ultimate authority on questions of orthodoxy versus heresy. However, the Monophysite controversy did not end here. Many eastern churches continued to reject what they considered to be the "diaphysitism" of the Chalcedonian formula. These survive today as Miaphysite churches of the Oriental Orthodox communion. These include the Armenian Apostolic Church, the Syrian Orthodox Church, the Indian Orthodox Church, the Coptic Orthodox Church and the Eritrean Orthodox Church. Moreover, the ending of the Acacian schism by no means brought to a close the conflicts between Rome and Constantinople. Several more controversies and schisms would arise over the next five centuries, culminating in the Great Schism of 1054, which has lasted to this day. That said, Pope Hormisdas must certainly be recognized as one of history's most successful popes, even if it was the death of the eastern emperor, more than Hormisdas' own efforts, which resulted in Rome's triumph. Another legacy which Hormisdas left to his church was his son, who would soon become Pope Silverius (536-537). The reason for Hormisdas becoming the patron saint of stable-boys is something of a mystery. It may be that he has been confused with a certain general of the same name, who famously told Emperor Trajan that since the emperor wanted to construct a colossal statue of a horse, he should be build and equally colossal stable for it. Alberigo, Giuseppe. The Oecumenical councils from Nicaea I to Nicaea II (325-787). (Conciliorum oecumenicorum generaliumque decreta, 1.) Turnhout: Brepols, 2006. ISBN 9782503523637. Cunningham, Agnes. The Early Church and the State. Sources of Early Christian thought, 4. Philadelphia: Fortress Press, 1982. ISBN 9780800614133. Frend, W. H. C. The Rise of the Monophysite Movement. James Clarke Company, 2008. ISBN 9780227172414. Fortescue, Adrian. The Reunion Formula of Hormisdas. Unity studies, no. 16. Garrison, NY: National Office, Chair of Unity Octave, 1955. OCLC 18575489. Heather, P. J. The Fall of the Roman Empire: A New History of Rome and the Barbarians. New York: Oxford University Press, 2006. ISBN 9780195159547. Kreilkamp, Hermes. Rome and Constantinople in the Fifth Century: A Study in the Relationships of Patriarchal Churches. Washington, D.C.: School of Canon Law, Catholic University of America, 1971. OCLC 224325474. Loomis, Louise Ropes. The Book of the Popes: To the Pontificate of Gregory I. Merchantville N.J.: Evolution Pub, 2006. ISBN 9781889758862. This page was last modified on 15 May 2015, at 16:29.